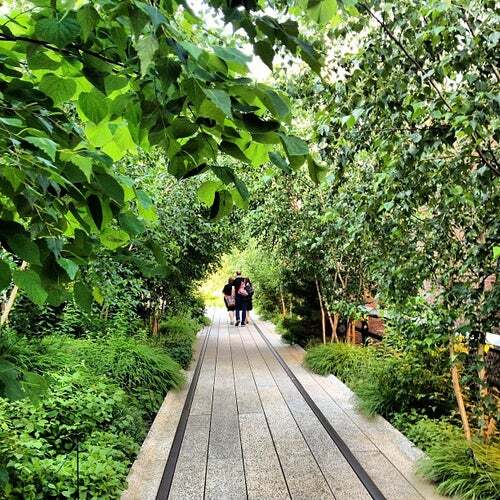 If you haven't been to the new High Line, seize the day! This is the best new park in the city, located on the historic High Line lifted freight track from the 1930s. The last train ran on the high line in 1980 but the fun has just begun. Section 1 of the High Line opened in June of 2009. This grassy urban oasis is filled with public art and eye candy galore. The second section opened in the summer of 2011. Such a relaxing stroll and fun way to see the west side of Manhattan. Also, a great way to cut across the island vertically. Start around 23rd and work your way down to the Meatpacking District. You will find plenty places to eat and enjoy your walk. And on the way back, digest your food. The weekend pedlock is at ridiculous levels. Go during the week if possible. An elevated railway gorgeous walkway, lots of trees, and the views are amazing!! Seriously...why didn't i know about this sooner? The High Line is UNBELIEVABLE.